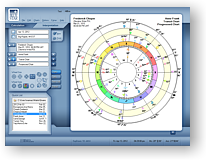 Blue*Star is a 21st Century astrology program combining traditional astrological chart wheels and calculations with fully illustrated state-of-the-art interpretive reports – sixteen separate reports in all. Those of you who are professional astrologers know that single reports (with rights to distribute) often sell from $100 to $300 each. Blue*Star includes complete reports—all fully illustrated and professionally formatted. How can we do this? The answer is simple. Although all of the chart wheels and calculations print out as PDF files, the sixteen Blue*Star interpretative reports are limited to on-screen viewing, EXCEPT in the professional version, Blue*Star Pro, in which case all sixteen reports can be saved, printed, and emailed as PDF files. The difference is reflected in the price. Blue*Star is $$199.95, while Blue*Star Pro (which can print/PDF all sixteen interpretive reports), is $499.95. This gives you two options. If all you need are reports for your family and friends, then Blue*Star, at $99, may be all you need. If you are running a business, however, and want to sell and distribute reports, then Blue*Star Pro, at $499, should be your choice. Either way—with either one—you will get all of the reports, plus loads of chart wheels and calculations. Blue*Star is part of the newest generation of innovative Matrix programs having ease-of-use professional tools such as Two Wheel Display, Aspects List Box, Arabic Parts, Time*Scan, Around the Wheel, Midpoints, Designer Wheels, and more. Blue*Star includes sixteen screen versions of the most popular Matrix reports, completely formatted and with full-color images. You can read and study any of these reports (for any birth time) on-screen. 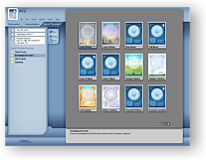 Blue*Star Pro includes these same sixteen reports, but in this program the full reports can easily be saved, printed, and emailed as PDF files. Plus, you can add more reports to your collection. 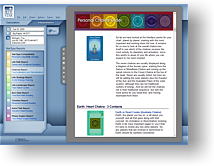 Add just what you need to Blue*Star: You can add additional professional reports, charts for Astrological and Life Events, Time*Scans, Synastry charts, and more. NOTE: You have to own Blue*Star Professional Version to install the Interpretation modules. Blue*Star requires a computer with Windows 7, 8, or 10. With 32 MB RAM memory or more, and 5 Gb hard disk space, 1 Gb for the program. Also compatible with either 32 bit or 64 bit operating system. 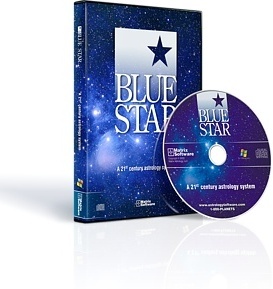 Blue*Star also runs on Mac computers with Windows Operating System installed. On screen natal, transits, progressions, directions, returns for all planets. 16 On screen personal reports. Blue*Star is a wonderful Program that combines chart calculations and interpretative reports in one package! BlueStar includes sixteen complete astrological reports that are fully illustrated and professionally formatted.